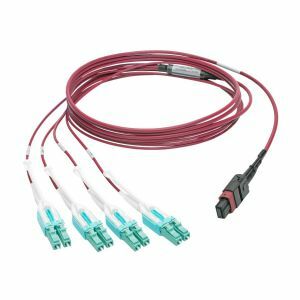 The three-meter N845-03M-8L-MG MTP/MPO to 8xLC Fan-Out Patch Cable supports 40 Gb Ethernet speeds and is designed for high-density connections between 40GBASE-SR4 network equipment. With one male MTP/MPO and eight male LC connectors, this OM4-rated multimode fiber optic fan-out cable supports various multi- and single-fiber connections. It fully transmits 40GBASE-SR with four fibers transmitting at 10 Gbps in each direction. Push/pull tab connectors are easily accessible in high-density data center applications and make the cable easy to install and remove with one hand. The magenta-colored N845-03M-8L-MG features a premium-grade ceramic ferrule for 10 GbE and faster applications. The slim, space-saving uniboot design makes cable easier to manage. The plenum-rated jacket is perfect for connecting high-speed network components in ceilings, walls and ducts. The sturdy plastic housing is built to last a long time.